Axial has sent us their latest kit to check out; the Wraith Spawn! The Axial Wraith™ Spawn kit version is packed with performance features and option parts that you add as you build it. The virtually bulletproof AR60 OCP axles are ready to take the Spawn through its paces whether blasting through the wide open desert or hammering its way through the toughest rock trails. The 2.2 Maxxis Trepador tires are a proven true grip standard, wrapped around industry proven Method IFD™ beadlock wheels. Whether you are rock racing or backyard bashing, the Wraith™ Spawn is ready for action. 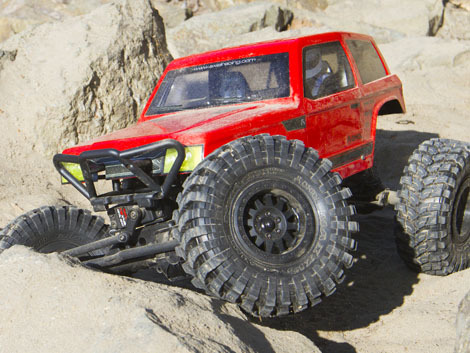 The Spawn showcases Axial's newest purpose designed body. "For the Wraith Spawn RTR, and now the kit version, Axial wanted to create a body that had a classic feel with modern styling. Just as we have seen in the use of retro designs in the auto industry, with cars like the Dodge® Challenger, we have also seen off-roaders use classic trucks in modern builds. To implement this idea, our Design and Marketing teams brainstormed and discussed some of our favorite trucks and SUVs from the late-70s and early-80s. Taking those vehicles into consideration, the Design team then studied the iconic styling cues of these vehicles and began sketching ideas. As a result, we developed those ideas and created a unique retro styled Axial SUV body - the Spawn." Since we've built a Wraith before there won't be anything here on the build unless necessary, but the body is another story. I am open to suggestions on paint scheme. If you saw the YETI build then you saw the body I did for that, so I'm up for another custom scheme.